Dr. Sellner obtained his Bachelor of Science and Doctor of Dental Surgery degrees from University of Western Ontario, and has been with TechTown Dentistry since opening in 2007. Dr. Sellner enjoys meeting new people and providing superior dental care in a technologically advanced office setting. He also enjoys continuing education and lifelong learning to offer his patient's the most up-to-date knowledge and treatment options. Dr. Sellner is a member of the Canadian Dental Association, Ontario Dental Association and has recently been elected President of the Waterloo Wellington Dental Society. Dr. Sellner was born and raised in Waterloo, Ontario and still resides in Waterloo with his wfie, Hayley and daughters, Brooklyn and Olivia. In Dr. Sellner's spare time he enjoys sailing, downhill skiing and golfing. "When life gives you a hundred reasons to cry, show life that you have a thousand reasons to smile. "- Unknown. Dr. Jones obtained his Doctor of Dental Surgery degree from University of Western Ontario's Faculty of Dentistry in 1975, and is an associate lecturer at Western. Dr. Jones enjoys keeping current in continuing education by learning about new dental practices and methods of treatment to offer his patients the most up-to-date recommendations. Dr. Jones is a past president of the Kitchener Grand River Rotary Club and a former Rotary Area Governor representing the Kitchener-Waterloo Rotary Clubs. He is a recipient of the Rotary Paul Harris Fellowship and Catholic Family Counseling Centre Community Service Awards. Dr. Jones was born and raised in Kitchener-Waterloo and still resides in Waterloo with his wife Diane. Dr. Jones likes playing tennis and he and Diane enjoy spending time with their four children and two granddaughters, at their cottage in Georgian Bay. 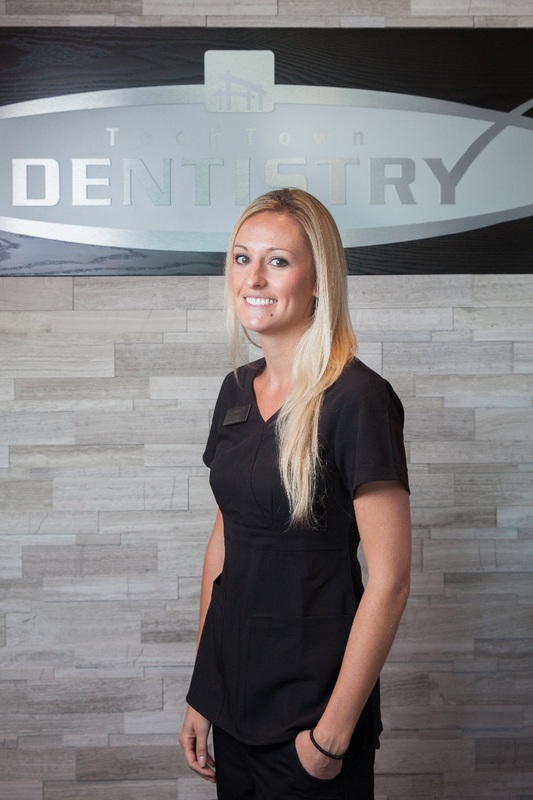 Alana has worked with TechTown Dentistry since we first opened in 2007. She obtained her certification in Level II Dental Assisting from Fanshawe College in 2004 prior to receiving her Dental Hygiene diploma in 2006 from Georgian College. Alana is an active member at the College of Dental Hygienists of Ontario and Canadian Dental Hygienists Assocation. Alana loves to meet new people every day and feels she can make a difference in helping our community improve their oral health and their overall health. She finds her job rewarding as she applies her knowledge gained from many continuing education courses and feels continued learning is curcial in her ability to advise her patients regarding their oral heath condition and needs. Alana is originally from Kincardine, Ontario where she spends a lot of her spare time with family and Friends. Alana also enjoys horse back riding and volleyball. Caren received certification in Pre-Health Sciences before going on to complete the Dental Hygiene program at Confederation College in Thunder Bay, Ontario in 2007. Caren has been with TechTown Dentistry since opening in 2007. What Caren loves most about her career is her ability to help others achieve and maintain their oral health, which is an important factor in their overall health. She builds trusting and caring relationships with her patients and likes to share her knowledge in dental hygiene therapy, preventative treatment and self-care techniques to provde her patients with the most thorough and comprehensive care. Caren is currently a part of a dental hygiene study group specializing in periodontal disease and treatment, and is knowledgeable in new products and therapies. Caren is a member of the College of Dental Hygienists of Ontario and the Canadian Dental Hygienists Association. Caren was born and raised in Thunder Bay, Ontario and currently resides in Stratford, Ontario with her husband Jeff, son Andrew Caren enjoys walking, cooking, listening to music and has a passion for creating jewellery. 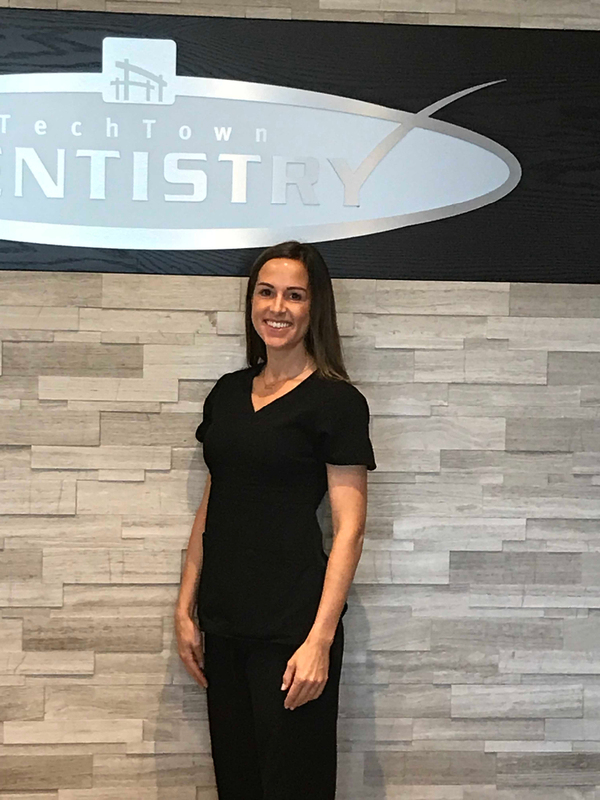 Gina received her diploma in Health Office Administration and Medical Secretary certification from Conestoga College and has been with TechTown Dentistry since opening in 2007. Gina loves building relationships with patients, helping others and meeting new challenges each day. She likes to work with and learn about new technologies and is encouraged to keep up-to-date with continuing education. Gina is a member of the Ontario Medical Secretaries Association and was honoured with the Dental Science award from Conestoga College. Gina was born in Cambridge, Ontario and currenly resides in Cambridge with her husband, Geoff and daughers Makayla and Mackenzie. In Gina's spare time she likes spending time outdoors with her girls, and she and Geoff enjoy riding their motorcycles. Amanda joined the TechTown team in 2014. She obtained her certificate in Level II Dental assisting in 2001 prior to becoming a Registered Dental Hygienist in 2013. What Amanda enjoys most about being a dental hygienist is forming relationships with patients and helping them achieve optimal oral health through preventative treatment and education. She is involved in continuing education seminars focusing on periodontal health and how it can effect overall systemic health. Amanda was born in Stratford Ontario and currently resides in Waterloo with her husband Chris and her three children Riley, Abigail, and Halle. Julie obtained her Dental Hygiene diploma in 2004 from Georgian College in Orillia, ON. She is an active member of the College of Dental Hygienists of Ontario and the Ontario Dental Hygiene Association. She is dedicated to providing exceptional dental hygiene care through prevention, awareness, education and comprehensive treatment plans. She values working together with patients to achieve their oral health goals. Julie is committed to life long learning and has a passion for teaching. Her newest project involves educating parents within the community regarding oral health practices for babies and toddlers. She has partnered with a local community group and has been a re-occuring speaker. Julie was born and raised in Peterborough, ON. She currently resides in Waterloo with her husband Troy and their two children Avery and Brody. Julie loves the outdoors, gardening, walking, running and enjoying a good laugh with her family and friends! Hayley obtained her Dental Hygiene diploma in 2007. Prior to her Dental Hygiene degree she completed her level II Dental Assisting certificate. Hayley is a member of the College of Dental Hygientists of Ontario & the Ontario Dental Hygiene Association. Beyond her dental credentials Hayley is also a Registered Nutritionist. Hayley is dedicated in providing optimal oral health and overall health through education and preventive treatment. She keeps her knowledge current by being part of a dental hygiene study group where their main focus is Periodontal knowledge. Hayley was born and raised in Peterborough and currently resides in Kitchener with husband Tim, daughters Brooklyn & Olivia and their dog Charlie. When not in the office Hayley loves to run, ski, play tennis and enjoys a good glass of wine. Shakilah graduated from CDA II from Everest College in 2008. She has been working in Waterloo ever since. Shakilah is passionate about educating clients about good oral hygiene and providing them with the best possible dental experience. Shakilah enjoys living an active and healthy life style, she currently resides in Waterloo with her husband and 2 daughters Neveah and Jazmine. Live each day to it’s fullest, enjoy this event called life! Kellie obtained her CDA ll diploma with honours in 1997. Kellie enjoys working in healthcare, seeing patients happy with the treatment they receive and the end results are very rewarding. On her off time Kellie enjoys gardening, walking, and loves a great action movie! Kellie was born in Gander, NL and now resides in Kitchener with her daughters. Katherine received her diploma in Dental Assisting in 1990 from Durham College, then worked as an assistant for 10 years before taking a few years off to raise her 2 sons. Upon re-entering the work forces as a Dental Receptionist for 12 years before joining TechTown Dentistry. Katherine was born and raised in Niagara Falls and currently resides in Waterloo with her husband Chris and sons Cody and Kyle. I love working in the dental field, the bond and trust that is created with patients is such a wonderful experience!